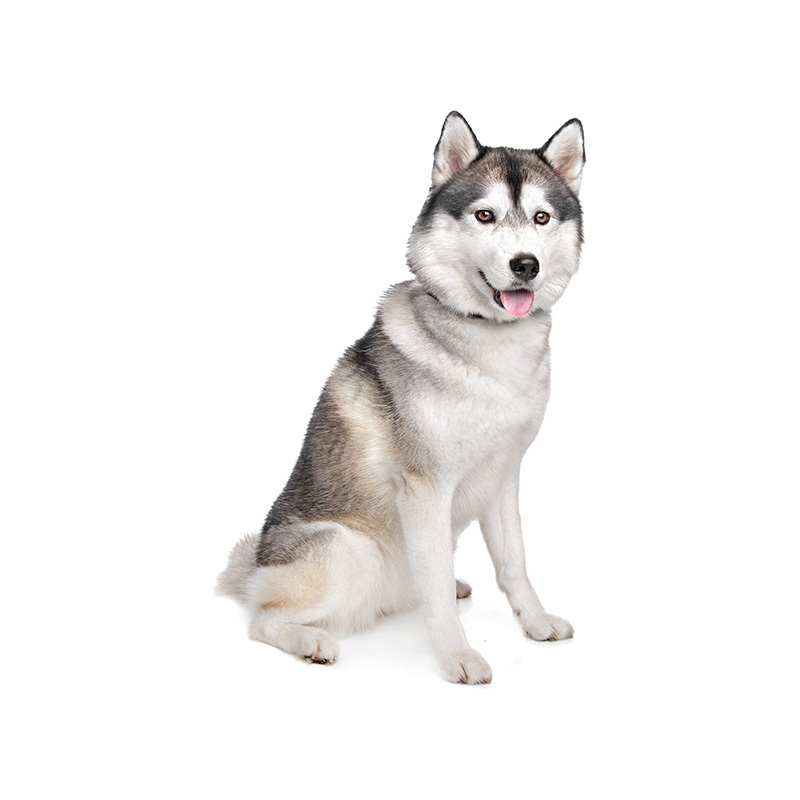 The Siberian Husky was originally used in Siberia to herd reindeer and pull sleds. Even though they have a wolf-like appearance, there is no wolf in this breed. They descended from the oldest known Eskimo dogs and were bred to pull heavy loads over long distances in tough weather conditions. They were brought to North America in 1908 to participate in a 408-mile dogsled race called the All-Alaskan Sweepstakes, and they soon became the most celebrated of all sled dogs. Siberian Huskies really grew in popularity and became famous when they were used to travel over 600 miles on frozen tundra to bring medicine to Nome, Alaska during a diphtheria epidemic in 1925. Siberian Huskies also served in the U.S. Army in their Arctic Search and Rescue Unit during World War II. Siberian Huskies have an exuberance for life and a joyful demeanor, which make them excellent companions. Even though they resemble a wolf and some have intimidating icy-blue eyes, the average Siberian Husky is very friendly with its family, children, strangers and basically . . . everyone. In fact, if someone broke into your house, your Husky might just welcome them with great enthusiasm. Siberian Huskies love to run, and sometimes love to run away, so you’ll need to make sure they’re on a leash or in a fenced-in yard. They are good with children and love to play with them; however, as with any dog, you’ll need to teach children how to play with their pet to avoid any unintentional injuries. Huskies are very intelligent but sometimes are hard to train. Siberian Huskies usually weigh between 35 to 60 pounds and stand approximately 20 to 23 inches tall. They are a medium-sized dog, and their build is powerful and athletic. Siberian Huskies have a thick double coat that comes in a variety of colors, most common are black and white, red and white, gray and white, or silver. Their coat only requires routine brushing, but when it sheds in the spring and fall, there will be hair all over. Their eyes are usually very striking and can range from ice-blue to brown. Sometimes their eyes may be bi-color, with each eye being a different color. Siberian Huskies are the 9th most popular breed of dog registered with America's Pet Registry Inc. One of the dogs used in the last leg of the trip to deliver medicine in the 1925 diphtheria epidemic in Nome, Alaska is immortalized as a statute in Central Park in New York City. His name was Balto.